Carol got it first. Jennifer, our tour organizer, is a French teacher at a high school and Carol is the school's counselor. They spent a lot of time together, so I don't know when it was that we became aware of the fact that Carol wasn't feeling well. I think it was on the last day in Paris. People were pooling the meds they had brought to see if they could find anything that would help her feel better. The day we left for Italy, I asked Jennifer if she was feeling all right. She looked terrible. She is a very quiet person and she said she thought she was feeling sick. She went with us to Cinque Terra and even got off to hike around, but she skipped the trip to Portofino for dinner that night and sent Ian out to buy pasta for her. When we got to Siena, she was feeling so sick that she skipped our welcome dinner in Florence. Ian and Antonio took her -- on the bus! -- into Siena to see a doctor and get meds. I think she skipped the day in Florence entirely (I don't remember her being on the bus), but by the time we left Florence, she was feeling OK again. After I returned home, I had e-mail from two other members of our group who had come down with it when they got home. I was feeling pretty cocky. I had gotten home, Walt was in Santa Barbara and I spent the day unpacking, organizing, and starting to look at my photos. I didn't go to sleep until 11 p.m. and, with one brief interruption to move from the couch to the recliner, I slept all night until about 7 a.m. I had licked the "jet lag" thing and was already back on California time and feeling just fine. Walt returned home the day after I did and all was well, but around 9:45, I was feeling sleepy, so decided to go to sleep. I woke up, wide awake at 1:30 a.m. and since I was so into the photograph thing, I sat up until 5 loading pictures into Flickr. At 5, I was feeling sleepy again, so I climbed into the recliner and went back to sleep until 9. When I woke up at 9, I had "the bug." My chest was tight, I couldn't breathe, I had no voice, and I felt awful. I spent almost the entire day in the recliner napping. I would get up to start another batch of photos uploading to Flickr, but since it takes a very long time to upload a lot of photos, I just crawled back to the recliner while Flickr did its work. I hardly ate anything and Walt went out to get dinner, which I had just a little of. I had to review a show last night and could barely stay awake through the lively Thoroughly Modern Millie. Walt must have poked me 100 times to wake me up (he said I was moaning off and on!). When we got home, I went straight to the recliner and was asleep almost immediately. I woke up a couple of times, but went right back to sleep again. As I write this (5 a.m. -- I finally got up because I really had to get the review in right away), I know that I am probably going to spend most of today in the recliner too. The chest isn't quite as tight as it was, unless I cough. But now I have a sore throat and am feeling achy, to add to the other symptoms. I'm hoping that the five of us who caught this thing are the only ones who get it...now I understand why Jennifer looked so bad the day she got sick! Yesterday I said I would talk about getting home from Florence. Lemme tell you, ain't nobody gonna sneak anything by security in Paris! The day started at 4 a.m., loading the bus. By 4:15 we were on the road. The hotel had packed breakfasts for us to take with us. 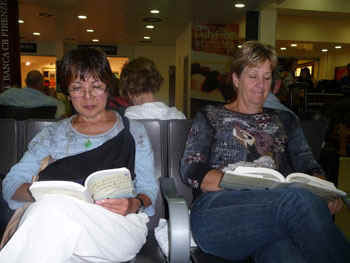 We got to the Florence airport where most of us were flying out within the hour. It wasn't until I was standing in the line to check in that I realized that, in getting dressed in the middle of the night, I had put on my t-shirt inside out. Ian was taking the train to the north of France, Char and Tavie were flying to Belgium to visit relatives, and Jeri, since she was going to Boston instead of San Francisco, was to get her connecting flight in Berlin instead of Paris. We said our goodbyes and left the others standing there as we climbed the...yes, stairs again...to the security area. After we went through security, we went downstairs again to the waiting area and eventually boarded a bus to take us to the plane to Paris. It seemed like an hour would be plenty of time to catch our connecting flight, but the Paris airport is crazy. I don't know if this graphic helps. We flew into terminal three and were leaving from 2E, gate 72. To get to 2E, you had to board a tram that took out OUT of the airport and round and round the parking lots, which meant that you arrived at Terminal 2 and went back in again, which means going through security again. I've lost track of exactly what we did. You take a huge long escalator up to the departure floor, then line up, Disneyland-style, in switchbacks with everyone else in Europe. There is a first guy who tells you whether you should go to the yellow line or the green line. I don't know what the determination is, since half of us were yellow and half were green. Then you go to the examiners, who are in booths. They direct you to where your gate is. Not bad at all, I thought! Well, the terminal directs you to gates 21-76. We were in gate 72, which tells you how far we had to go. You catch a tram to take you to 51-76 and Jennifer herded us all on the tram, only to decide at the last minute we were on the wrong tram. She pulled two of us out and yelled at the others "Don't forget--gate 72!!!" We took the next tram and discovered that when we got there the others were already there waiting for us. Now were in another switchback line that stretched forever. Jennifer tried to get someone to let us cut in since our plane was leaving so soon, but was told to wait in line. This is where you take off your shoes and practically disrobe. From there it was only 20 or so gates to the plane (somehow I thought there was a third switchback line, but I can't remember where it was), and the moving walkways weren't all moving. It was like being back in Florence again without the 90 degree heat. I think I was the next to last person to board the plane, but once I'd gone through the two screenings at the gate, I knew I was home free. I had chosen a seat on the aisle when I checked in the night before, which was very smart because I could stretch my bothersome leg out into the aisle without problem. The only problem was that the guy in the window seat seemed to want to get up every hour at least, so I spent most of the ride getting up to let him in or out. But the food was good, I was able to watch a movie (in English, even--I watched Doubt in French coming over because I couldn't figure out how to get it in English! ), I finished one book and started another and the time really did almost "fly." I was never so glad to see anyone as I was to see Mike, Char's husband, who met us at the airport. Since the trip began, I had expanded from one suitcase to two, plus my backpack, and I couldn't even see where to catch BART and the idea of schlepping all the luggage on BART, a city bus, and the train was almost like doing Florence all over again. It was so good to be home again! 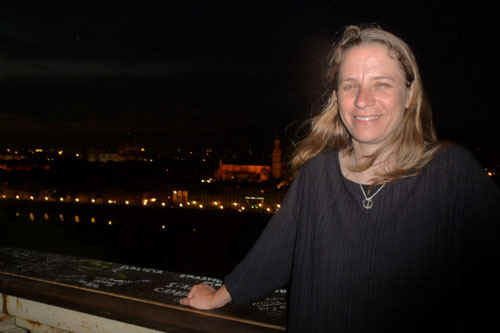 I love this shot of Jeri, on an overlook of Florence.